Off Topic: Is Bridesburg in the Northeast? Bridesburg is an interesting – and confusing – case. Originally, there was a sharp bend in Frankford Creek as it approached Bridesburg, so that Bridesburg was positioned south of the Creek and thus technically not part of the NE. However, the area at the bend was prone to heavy flooding and in the 1950s the Creek was straightened out so that it ran directly to the Delaware River without bending. Since then, Bridesburg has been north of the Creek and so could be considered within the boundaries of NE Phila. If you consult that City Planning Commission publication, however, you will see that they don’t include Bridesburg in NE, but include it in a Bridesburg/Richmond/Kensington district. 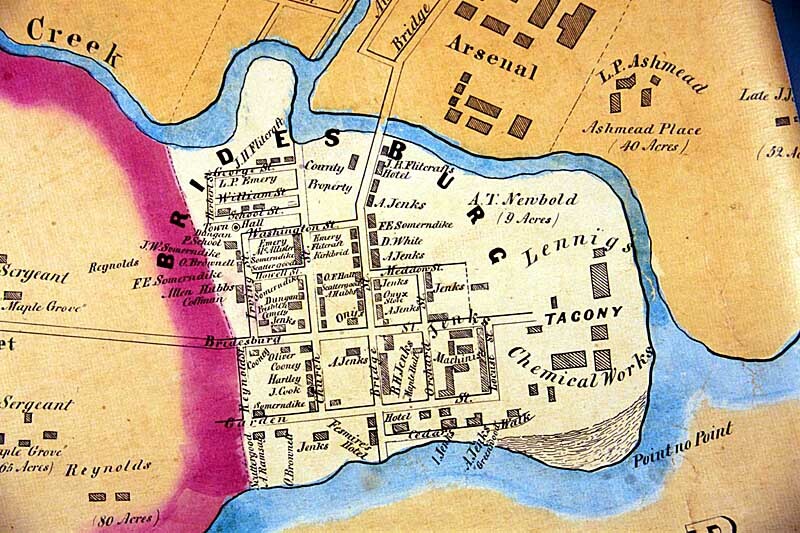 Many people do consider Bridesburg part of the NE and technically it should be considered as such, but you could also make an argument that historically it was not part of the NE and that the City Planning Commission does not consider it in the NE. I’m about 100% sure that anyone with a real estate interest in Bridesburg would consider themselves to be a river ward and not want to be associated with the Northeast. I know the crew over on the Pridesburg forum like to consider themselves an island unto themselves. Full disclosure: My father (and this site’s founder) grew up in Bridesburg, and I’m sure will chime in. 7 Comments on "Off Topic: Is Bridesburg in the Northeast?" Not part of the Northeast and does not need to be. Well back in the olden days when I was growing up in Bridesburg, we thought we lived on an island because you almost always had to cross a bridge to get out. Much of the rest of the city looked down on the Burg because of the stench from two huge chemical producers and the open sewer that the Frankford Creek had become. Fast forward 30 years and the chemical smell is much improved and the Frankford creek has been cleaned up and somewhat moved although we all know that it crosses under Bridge Street just like it always did. Bridesburg is a place of its own and does not need to be a part of the Northeast. The insularity that was Bridesburg of old may have helped it maintain and improve its community quality of life. Isn’t the stench now coming from the sewage treatment plant down by Castor and I95? I remember never smelling it except when I was away down the shore in the summer. It’s like a week away reset my sense of smell until the car came up north on I95 returning home. That is the most common smell out there coming up 95 now. Growing up with the chemicals brewing around me, I learned the smell of phenol at a young age. You can still smell it around Sunoco sometimes. That may still be the most important product coming out of that plant now. Back in the day, Rohm and Haas had some stuff that would eat the paint off your car overnight. Imagine what it would do to the lungs. But the hazard is long gone now. Is it not rather odd, that Mr. Jack McCarthy resigned his position with the Historical Society of Frankford in March of 2010, but you contacted him in April to ask him a question? Furthermore – Mr. McCarthy gives you an opinion – not historical facts- and then you post it several months latter – why? You had answered your own question (based on historical facts) two years ago. PennState’s online library has a 1941 paper about the old towns and districts of Philadelphia. It provides a nice history of the boroughs and townships of Philadelphia to the run up to the 1854 Act of Consolidation. This publication was openly & notoriously available to the public as a free download for many years. For some reason that publication is no longer available on the Penn State server. The publication falls under “Fair Use,” for education and criticism and therefore is not subject to “Institutional Censorship” which I find so prevalent today. If you would be so bold as to challenge the status quo, I will send you a PDF copy of “Old Towns and Districts of Philadelphia” to place on your web-page as a free download. Are you Game? Or, perhaps you would rather publish the opinions of a hostile librarian who resigned in a rage, as opposed to a true historian that actually contributed something of true historical significance – such William Bucke Campbell? Yeah that timeline does seem right about his (I suppose) abrupt departure from the Historical Society. I don’t think a [citizen] journalist should really take sides though. If I have history questions and he’s up for answering them. Then he’s gonna be on my contact list. And I would absolutely post anything you’d like to send us. Your researching talent is near legendary by now. I just e-mailed you a .PDF of “Old Towns and Districts of Philadelphia” to place on your web-page as a free download. Also cite the fact that this copy was digitized by the PSU Libraries and given away to the Public as a free download. Within the context of “Fair Use” they should not attempt to place any restrictions on reissuing it. If they do, I will just create a new PDF copy and release it. The Society has in their library, a complete set of the Publications from the now defunct City Historical Society of Philadelphia. So – Old Towns and Districts of Philadelphia would also be available at the HSF Library. Campbell, William Bucke. 1942. Old towns and districts of Philadelphia; an address delivered before the City history society of Philadelphia, February 26, 1941. [Philadelphia]: City history Society of Philadelphia.